I’m currently paying P1,000.00 every month for the school service of my kids. It’s actually a friendly price compared to the current asking price of other school service. But sometimes I’m still wondering if I can still save some more from the service fee. Initially, hubby thought of using our motorcycle to bring the kids to school every morning and hire Mang Albert, the school service driver/owner, to fetch the kids in the afternoon. The plan will save us P500.00 in our monthly budget. However, motorcycle may not be a good replacement for the real service vehicle. A good motorcycle is guided by zumo 665 (a motorcycle navigator), but it (motorcycle) may not be practical to use during the rainy months. 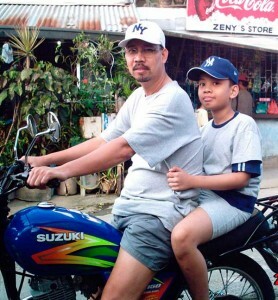 We can only depend on Mang Albert’s spacious vehicle to keep our kids safe and comfortable. Besides we’ve known the old guy since the kids were preschoolers. So, the next practical thing to do is keep Mang Albert’s services. Anyway, his service charge is still the cheapest around. This entry was posted in Kids and School and tagged motorcycle, school service on July 2, 2011 by Yami.